"Destinations" are the end point for your submission data, the final outcome. This is where all your information, signatures and/or images contained within, will go. In order to set up a Destination for your form, go to your "Forms" page. Click the link in the Destinations column of the form you would like to add the Destination to or click on the 3 dashes below each other to view the menu to add a Destination from there, as shown below. Note: If there are no Destinations added to your account, this button will read "0", else the number displayed is the amount of Destinations that has already been created for the specific form. This will take you to the "Destinations" page, where you will next need to click "New Destination". 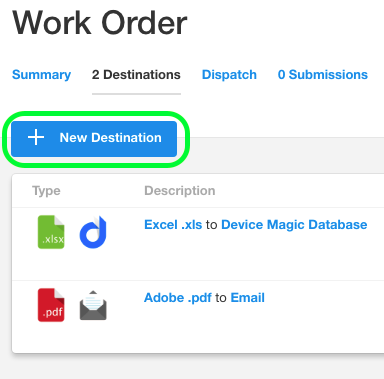 Note: By default you will have two Destinations setup for every new form you create. Note: Depending on the subscription package you have, your available destination options will vary. Once you have selected your Destination, you will be given the option to choose the format in which you would like the data delivered. Each of these options, depending on what you choose, have their own subsets or formats to choose from. Below is a screenshot of the available options when "E-mail" is selected as the destination. At this point, in Step 3, if you are on a paid plan, you will also see that you can specify to have your images, signatures and sketches sent to a different Destination. Step 4 will give you the option to add a Description to your destination. You can also set your destination to be Active or not here. When the Active box is unchecked, the destination becomes disabled. 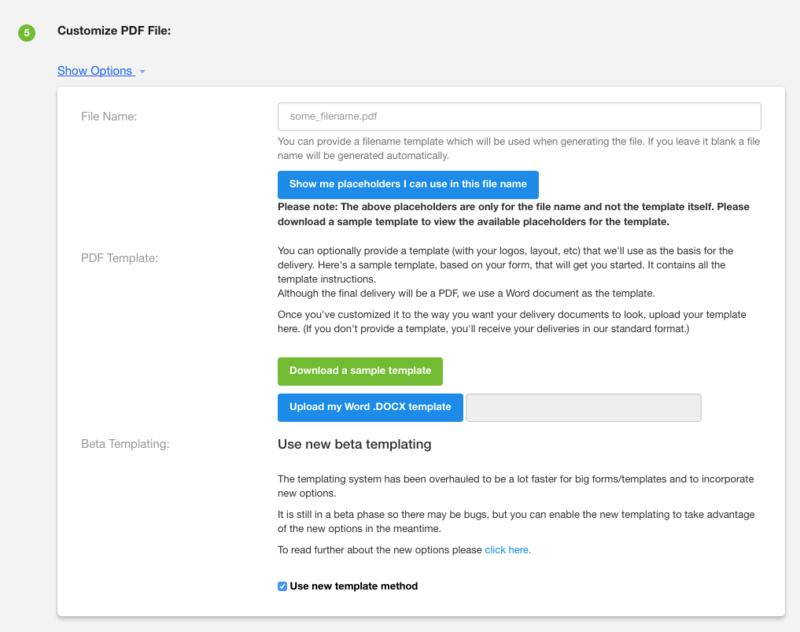 When you have a Word or PDF Destination that involves a template, click "Show Options" and fill in the necessary details. You will also be able to download a sample template that provides you with all the placeholders for the questions of your form. Depending on what your Destination is, you now may have to authorize your account (ex. 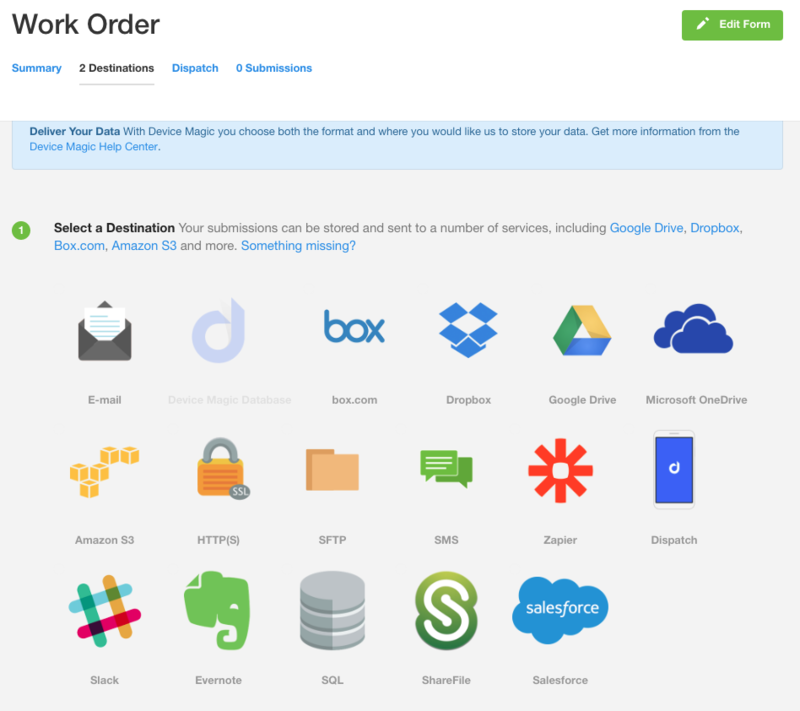 Google Drive, Dropbox, Box.com). Soon enough you will be done and ready to add the Destination. To do this, click "Create Destination". Want to learn more about how mobile forms and Destinations can help your business? Read more about mobile forms here.